Cox Spitfire, can anyone help date this thing? Hey guys, my Uncle picked this up for me at a garage sale. I have never seen a solid green one before, it was purchased in Canada so that may have something to do with it. I guess what I want to know is if it's desireable and what years this model was produced. 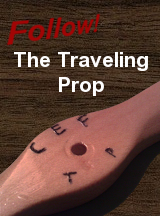 I don't know much about RTF's so looking for help from you collector types. 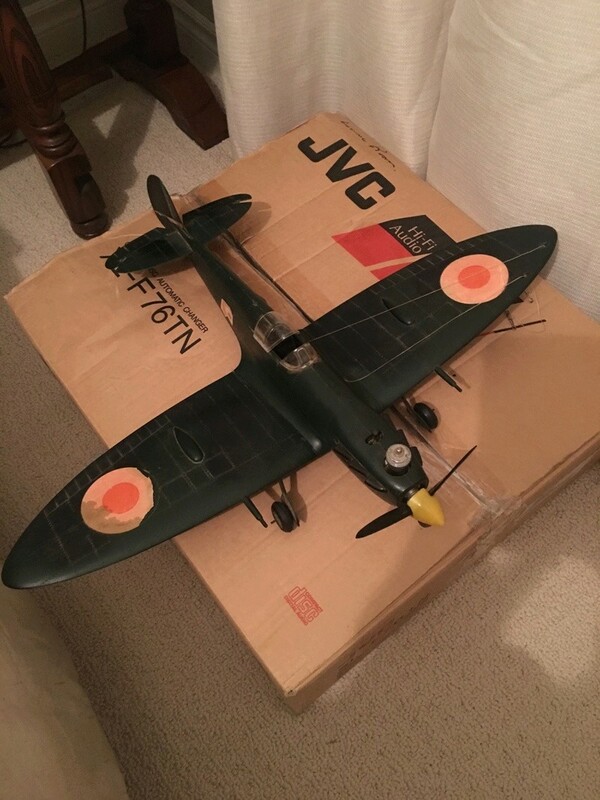 Re: Cox Spitfire, can anyone help date this thing? Cox Spitfire is very desirable, you don't see many for sale, rare to have the canopy. Many have damage gear mount from hard landing, breaks the plastic. Looks like Stuka pilots hiding under wing. From the looks of the picture it appears to have a bee type engine in it. Good catch. There's obviously no end to the planes Cox made that I never knew about. Cribbs74 wrote: Hey guys, my Uncle picked this up for me at a garage sale. I have never seen a solid green one before, it was purchased in Canada so that may have something to do with it. I guess what I want to know is if it's desireable and what years this model was produced. I had one when I was about 12 years old. That would have been in '66-'67. Looked just like this one. Sure wish I still had it. I never flew it because it was so cool looking, that I was afraid I'd crash it. Certainly looks like it, I have to wait until it's in my hands until I can give it a good once over. I'll also have to read up on all the cleaning tips you guys do as well! Wow.. it's great that you have Cox "bird-dogs" working for you Ron! What a cool find! Did/does either your Dad or Uncle fly models? Good to know that it's in safe-keeping, until you can retrieve it! Wonder if the "postee" is a spare engine? I'd love to have been there at that garage sale with your uncle, to ask some questions about the model's origin. It's always nice if you're able to document that info. It might mean nothing to the average person.. but most of us here would want to know more about where and when it was bought.. who flew it.. and their experience. Congratulations! I'm always hoping that I can find and rescue an old Cox model! Yeah, my Uncle is a big swap meet/garage sale guy. I let him know I was into model airplane stuff. Neither my father or uncle messed with flying models. Not due to lack of interest though, they were both raised solely by my Grandmother. My Grandfather passed away in '59 so money was tight and my Grandmother worked hard to provide so toys were a frivalous thing. Do you have it in your possession? It almost looks like there is some camo on it and its been cleaned off to point its barely visible? 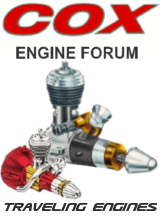 I always like to use the engine as a reference to get an approximation on it, does it have a 'stepped' cylinder, small or large needle, etc, etc.. It does look like a smaller needle, so possible early 70's? I know there was a Canadian version made without the yellow side numbers, and possibly made overseas, Australia, New Zealand, etc.? Hopefully Mud will offer a thought or two??? But i also wonder if it might have been made for Sears/Penny's/Canadian Tire, as they often seemed to be different than your typical Cox product? Not in my hands yet, the cylinder looks stepped, hard to tell in the picture. Hopefully I can get my hands on it soon and clean it up and figure out what I have. Thanks for popping on and commenting. I appreciate it. Mark Boesen wrote: Hopefully Mud will offer a thought or two??? To me, it looks like the Canadian version with black camo. It does not have the hot-stamped “AFP,” but it still has a small cylinder hole. And the tires appear vinyl/rubber not foam. All that only to say “I think” maybe very late 60’s early 70’s. When I finally get my hands on it I will provide better info and clearer pictures. I am guessing you guys are pretty close on the date range, with these things a range is probably as good as it gets. fire in the early 1980s. 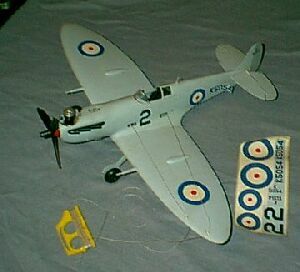 The COX Spitfire was NOT easy to fly at all, remarkably similar to the real one!, requiring experience. Believe me: It was QUITE DIFFICULT TO FLY!, depending on many factors. At close to sea level, with COX "Racing" fuel, and the outstanding Golden-Bee that my Spitfire came with, this plane was very close to the real Spitfire: VERY FAST, Very sensitive (overly sensitive) and maneuverable, to the point that most people in those conditions tended to over-control it, so that a sudden climb into the wind, resulted in a VERTICAL climb, followed by an almost vertical dive into the terrain! Mine was the previous 1964 model in light green plastic with dark green camo, and red color propeller spiner. It came with an EXTRAORDINARILY STRONG GOLDEN-BEE with large tank, with both vents upside. 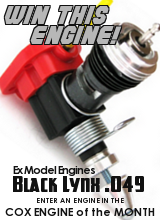 That engine was so powerful that the heavy plastic airplane climbed like if it was made from balsa! Too hot for a beginner! My first "flight" was less than three full turns ... Too much power, too much wind, a completely wrong control handle with the lines in the outermost holes: a recipe for sure disaster. The take-off was swift, and soon followed by a series of steeper and steeper climbs and dives, then a VERTICAL climb into the wind, followed by a similarly vertical dive into a hard concrete Basket-ball court. OUCH! INCREDIBLY, the beautiful red spiner took the brunt of the crash and simply disappeared forever. 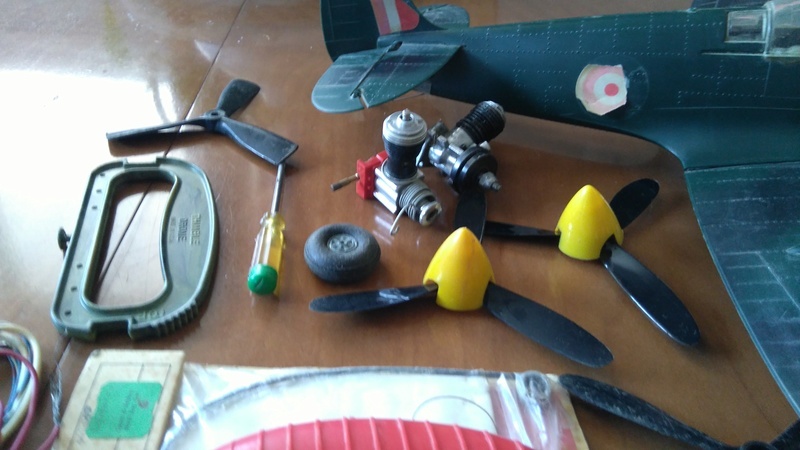 I searched for it for days, and never found it, but other than a slight scratch in the propeller hub, the rest of the beautiful Spitfire was completely undamaged! But my self confidence was SHATTERED! Several months afterthat flight, I returned to my city, at more than 7,350 Ft. of elevation above sea level, and my neighbor received a new Olive Drab COX P-51 (the one that the wing joined to the fuselage with rubber bands). His overly tenacious efforts to start its new engine, resulted in running it too rich for many minutes, and that resulted in a lame engine that was perfectly OK to barely pull the P-51 very lazily, with the P-51 just hanging from the prop and never going above 5 or 6 feet and never less than 3 ft above the ground. The lazy fligh made us (10 years old at that time) to believe that somehow, the Spitfire was IMPOSSIBLY HARD TO FLY, and that the P-51 was like an easy to fly "Primary trainer" for C/L! Immedaitely, I begged my father to buy me a COX P-51, assuring him that "This one is very docile, and I won't crash it"... 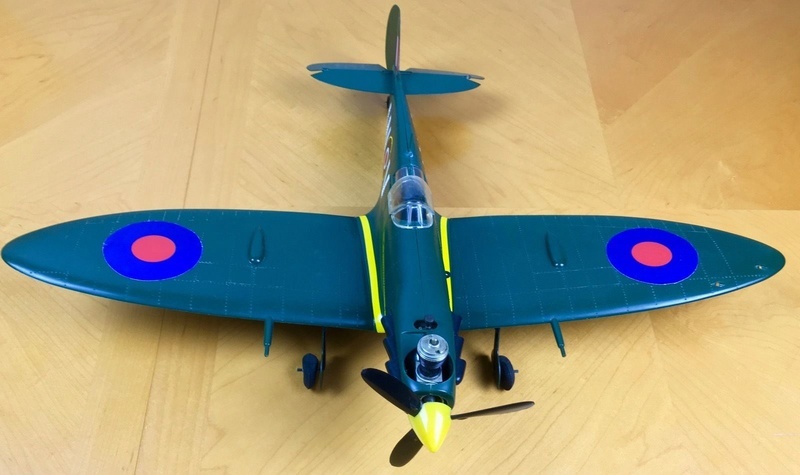 SO, my dear father bought me a new COX P-51, but as he was in the Navy, we were trasferred to a port, and the "docile" P-51 was transformed into a very nimble and almost as sensitive as the Spitfire beast, and I crashed it in a similar manner as my admired but terrorizing Spitfire! Two years later, I bought and built my first Balsa C/L model, a Sterling "Beginner's Ringmaster", that I was able to fly more than maybe 300 flights WITHOUT A SINGLE CRASH! Then I built the ribbed wing "Baby Ringmaster". Both were powered by the same engine from the then deceased Spitfire, the terrific Golden Bee that came with my Spitfire. 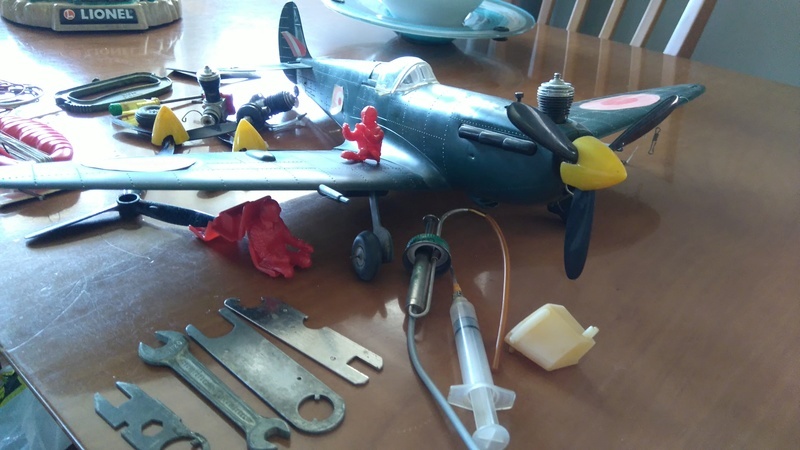 ONLY AFTER the accumulated experience from the Balsa made Ringmasters, I was perfectly able to fly a COX P-40 WARHAWK without craching it, for many times, proving that COX heavy, plastic planes effectively were able to fly, but those demanded experience or the help from an advanced modeler, never alone. Best Regards, Amclaussen, Mexico City. WELCOME TO CEF! You have quite the experience in flying Cox planes! We have lots of room for new members with stories, tails or techniques to share. I’ve finally made it to Canada! Had to look all over the house and garage to find this thing. It is in superb shape, very happy! It has a stepped cylinder, late 60’s early 70’s. Stickers are poor, but otherwise in very good condition. Should clean up well. In the description they also say that it does not have the landing gear ... it's a bit expensive, is not it? Cribbs74 wrote: I’ve finally made it to Canada! Had to look all over the house and garage to find this thing. It is in superb shape, very happy! It has a stepped cylinder, late 60’s early 70’s. Stickers are poor, but otherwise in very good condition. Should clean up well. Well, a couple things are in order. First, welcome back! And secondly, glad you finally got your paws on it. Too bad as another week from now, it would have made for the perfect adult easter plane hunt..... Although by your description, you did kind of have a hunt of your own to find it. Wow, jackpot Ron. Looks as good as the real one. Max envy. Sweet Ron you going to fly it display ? That fuel tank laying beside the syringe looks like a Stuka tank. Yes, it’s nice to be home with family, taking care of a lot of chores for my ailing father. I am ecstatic to have this model. To answer questions, I don’t know if I will fly it, it does have a silver bee engine in it. For sure it will be fired. It’s against my grain not to fly it, but at the same time it is rare and it can only be taken off or flown over concrete. I just don’t know. For now rhough it’s time to make it as new and go through the engine. 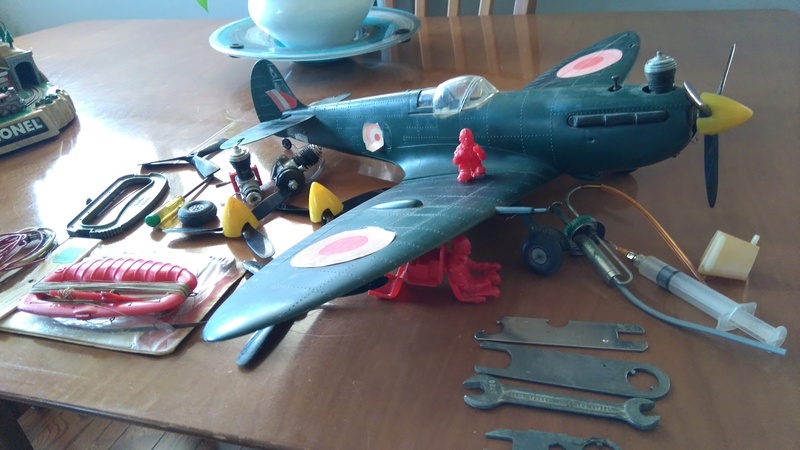 It did come with a couple Stuka pilots and a wen-mac that needs attention. Also came witha NIP roto start spring. Those items will be going to those in need. the Spitfire is a great plane to fly. Well designed, beautiful performance. My only warning would be for the landing; grease it!! The landing energy snakes its way through to that single screw. Hard landings can cause the boss to break and separate from the model. 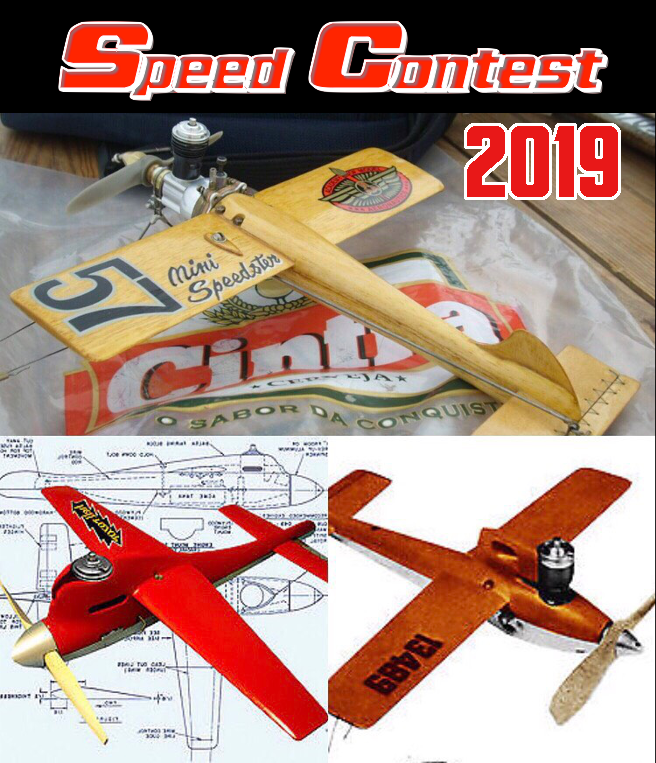 » Guillows Spitfire park flyer FINISHED!!!!!!!!!!! !